Marden was in the thick of the Second World War because of its strategic position between London and the Channel during the Battle of Britain. In common with many other Kentish towns and villages, Marden people became accustomed to air raids and dog fights overhead as British pilots and gunners tried to intercept German bombers en route to the capital. This part of Kent was known as Hell’s Corner. On September 5th 1940, German ace pilot, Franz von Werra, was engaged in a duel with a Spitfire. Lewis gunners on the ground riddled his petrol tank with bullets bringing his Messerschmitt 109 down at Loves Farm, Winchet Hill. Von Werra was captured but later became famous as “the one that got way” – the only German prisoner of war captured in Britain who escaped back to the fatherland. 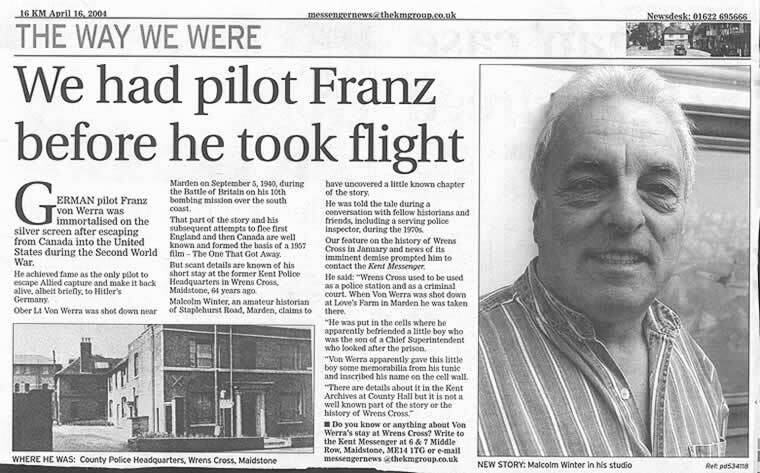 In the same year, two Germans were shot down over Marden towards Collier Street. They came down with their parachutes on fire, both were killed. On another occasion a German body was found entangled in the hop wire at Blue Farm. Stanley’s, the undertakers, buried all the German bodies in a separate area of the new cemetery: some villagers shunned them while others took pity and laid flowers. In the early 1960s all the German remains throughout the country were exhumed and removed to Cannock in Staffordshire to be reinterred in one place. 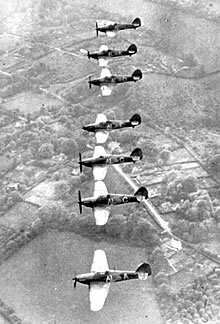 In all, 2424 German planes were shot down in the Battle of Britain. 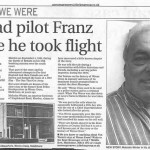 Allied planes also suffered losses: a Hurricane pilot came down in Church Farm on the Maidstone Road, as did a Polish pilot on a different occasion; another English pilot came down at Hartridge. When the much feared V1 flying bombs, the “doodlebugs”, were brought into the war, one week after D Day in the summer of 1944, Marden was in what was known as “V1 Alley” – the route into London. The first line of defence against these pilotless airplanes were fighters in the Channel, then anti aircraft guns on the coast, thirdly fighters above the Weald, then lastly a wall of barrage balloons nearer to London. The V1 was capable of inflicting great loss of life (one killed 160 in New Cross). People became attuned to the roar of its Argus engine and when the sound stopped fear set in as they knew it was about to fall. In all between 13th June 1944 and 29th March 1945 over 2200 doodlebugs fell on London, with 2,400 coming down in Kent. Kent certainly saved the capital from enormous loss of life from the doodlebugs. Marden received 15 and it was one of these that caused Marden’s second great war-time tragedy on 3rd July 1944, when a flying bomb, shot down by anti-aircraft fire fell on the Army Camp in Pattenden Lane. Ten members of the Royal Army Service Corps and one of the Army Catering Corps were killed; they are buried in two collective graves in Marden Cemetery. There were eight serious injuries. In September of the same year, Mike and Robin Judd remember another V1 with flames streaming out of the back swooping down on the village passing low over Turnpike House, pursued by a RAF Mustang. The boys, their mother and grandmother flung themselves to the ground. It too crashed to rest in Pattenden Lane, in a pond which it emptied, making a crater 3 times the size of the original pond. The Judds, who had minutes before got off the bus from Maidstone in Pattenden Lane, considered themselves to have had a very lucky escape.